ArtRage is a digital painting program made by Ambient Design, a New Zealand based software development company specializing in creative tools for artists. 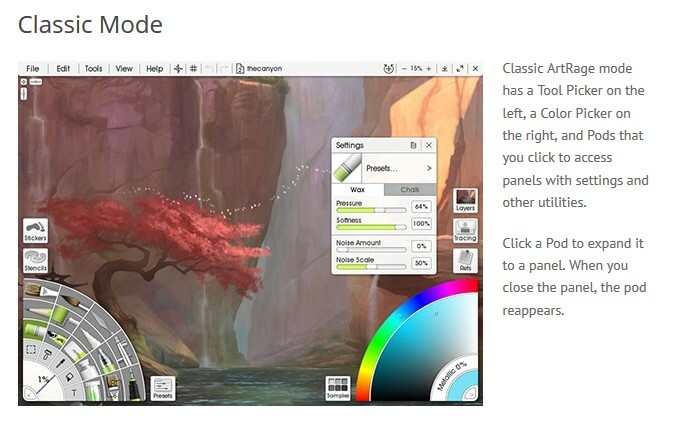 The company recently released version 5 of ArtRage and have kindly given me a copy to review. I’ve been a user of ArtRage since version 2.5 and am currently using both the desktop and Android versions. I’ll be talking about the Windows version of the product in this review. $US79 for a first time purchase (there is an even cheaper ArtRage Lite version). If you are an existing user they are offering very attractive upgrade options. It is available for both Windows and MAC. In addition there are apps for iPad, iPhone and Android which are much cheaper although these obviously do not have all the features of the desktop version. Isn’t using a digital art program cheating? In short no. It is a creative tool in the same way that a pen or a brush is a tool. Artists have been using tools for centuries. Have you ever seen someone enlarge an image using a grid? They were using a tool. Do you know of artists that use a camera to take reference photos? They are taking advantage of a tool. A digital painting program is simply a tool. It’s not going to do the work for you. It’s not going to miraculously turn you into an artist. You need to know how to use those tools to best advantage. You need to use those tools to express your unique creativity. There are some incredibly talented artist producting fantastic work solely by digital means. Is their work any less relevant than an artist who works solely in traditional media? Is their art “less than art” because of that? I don’t believe that to be the case. As a wildlife artist I work primarily in traditional media. I paint mostly in acrylics and soft pastels. Quick sketches. This enables me to play around with compositional ideas (or sometimes simply just to play around and enjoy myself without worrying about the result)! Problem solving. Sometimes I’m not sure where to go with a work so I might take a picture of the painting and import it in to ArtRage. Then I can play around with different things without fear of ruining my actual artwork. For example, I might use it to try different highlight placements in an eye. I can use it to see what sort of colours might work in a background. The possibilities here are endless. Preparation of working sketches. Sometimes I want to try different techniques with the same drawing. I prepare the original drawing in ArtRage and then using a projector I transfer that image to a surface of my choice. I don’t need to redraw the image from scratch every time as I’ve always got the original. Finished artwork for use as cards and prints. This approach negates the need for photographing, scanning and converting a painting to an appropriate digital format for the printer. It is all done within the program and the work can be exported in a variety of formats. ArtRage is an incredibly easy and intuitive program to use. Even someone not familiar with the program can get going very quickly. Basically you select a canvas size to work on, pick your surface (canvas, paper, etc), grab a tool (pencil, brush, etc) and then set to work. Here is the standard user interface. It is highly customisable and has two basic modes as shown below – Classic and Docking. 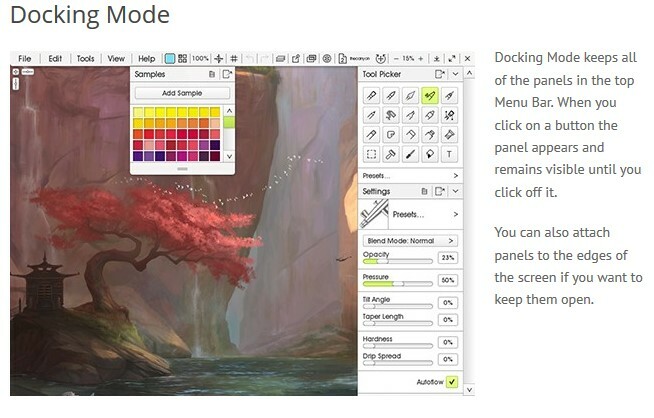 The great thing is that the various panels such as the colour selector or tool selector will automatically disappear when you move the pen over that part of the canvas. You can also choose which panels and pods you want to show or hide. Yet, don’t be fooled by the simple, clean interface because hidden beneath it are some very complex tools and options. You can play with the options as little or as much as you like. Even though I have used ArtRage quite a bit I primarily use the pencil tools. There are huge parts of the capability of the program that I have not touched and probably never will because they are beyond my current needs. I’m not one for endlessly tweaking settings as I would rather just focus on drawing. But if you want to you can adjust pressure, paint loading, tilt angles, noise levels, load in different paper sets and colour palettes, etc. But let’s get back to basics and why, as an artist, I love this program. For me the number one attraction is that it is just like using actual art materials. Or at least it is the closest that you can get to doing so on a computer. I’ve tried other drawing programs but have not found any that come close to ArtRage in terms of recreating the feel of the drawing/painting experience. Certainly none at this price. What do I mean? Well when you choose a pencil and start drawing you forget that you are using a digital pencil. When you pick up a paint brush and apply it the paint has texture, it mixes with the paint already on the surface just as it would on a canvas. Grab a palette knife and you can smear the paint across the canvas in an incredibly satisfying way. That’s what I mean. That’s what makes this such a great program. Of course it’s not perfect nor should anyone expect it to be. One of my few gripes with Artrage are some of the presets. I know that I can make my own and the new version allows full control over creating custom brushes but I’d rather paint than play with the settings. It would be great to have actual pencil presets that approximate real world pencil grades H, HB, 2B, 8B, etc. Instead the presets offer things like soft tip, hard tip, hard shader, thin precise liner, etc. which are not as intuitive to select and use. I find that his leads to a fair bit of trial and error and it can intrude on the process of making art. As I mentioned, I use ArtRage on a Microsoft Surface Pro 4 with the Surface Pen. It gives me touch screen and pressure sensitivity. At the very least you will need a drawing tablet (such as a Wacom Intuos Tablet and pen) that you can attach to your existing computer. Trying to use a digital painting program without pressure sensitivity could be likened to trying to paint a very detailed work and very small work with just your finger. It’s only going to lead to frustration. So the first thing I would ask myself before I part with my hard earned cash is: “Do I have (or am I willing to get) the hardware to make proper use of the software”? If the answer is yes then definitely give ArtRage a go. You can download a demo copy from the website so you can try it out before you buy. Another option is Fresh Paint by Microsoft. In my (admittedly limited) experience it is probably next best at recreating the feel of actual art materials but it is lacking in terms of flexibility and features. Of course Fresh Paint is a free program and if you are new to digital painting then it may just be a great starting point for you. Even so I would still give the demo version of ArtRage a try because that is not going to cost you anything either. Until of course you end up loving it so much that you actually have to buy the program…….don’t say that I didn’t warn you. ArtRage is a fantastic program and the developers should rightly be proud of what they have produced. Further, to be able to offer such a refined and feature rich package as this at the price they do is nothing less than exceptional. If you want a rock solid digital painting program that feels like you are painting with the real thing and you want all that at a bargain price, then look no further than ArtRage 5. It will remain one of my essential tools as an artist. Brendan, thank you for your review of Artrage 5. We have purchased Artrage5 and use it on our desktop computer with a Wacom intros tablet. Recently we purchased a Microsoft surface pro 4 (i5, 4md ram) and have attempted to install Artrage on it. Is there something that we are missing? I’m not sure exactly what difficulty you are having with the install. For me the install of ArtRage 5 was hassle free on the Surface Pro 4. Just like installing any other software. I would suggest that you contact ArtRage support for assistance. They are always willing to help. One thing to bear in mind is that the license is likely for single use (ie: installation on one computer only) so if you are trying to use the same license on a desktop computer and the Surface Pro 4 it will not allow you do do so. In that instance you would have to purchase another license. Again, ArtRage support would be happy to assist. Can you tell me a little more about what formats this exports to ? I am trying to find a digital drawing tool/ program that will let me send the results through to printers. Mostly A2 through to Post cards. Artrage saves files in a proprietary format (PTG) and you can print directly from the program (not something that I’ve personally had much need to do). You can also export your paintings in the following formats: BMP, JPEG, GIF, TIFF, PNG & PSD. I think that with the exception of JPEG you can also export the painting with a transparent background if that is important to your printing process. I’ve exported images for cards which I’ve then ultimately saved as a print-ready PDF for sending to a printing service. I was very happy with the results. 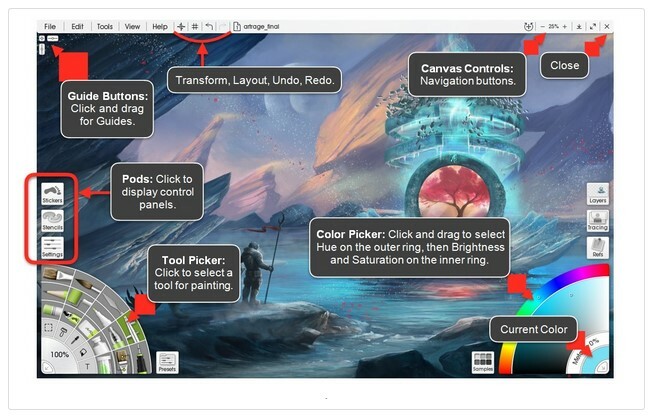 You can get further information from the software developers – Ambient Design (https://www.artrage.com). I’ve found that they are always happy to answer questions. As a bonus I notice that they have the current version on sale at the moment ($47 rather than $79). So you could download the demo for free, play around with it and see if it meets your needs. If you think it is going to work for you then you could purchase the program while it is on special. Thank you for such a quick and helpful reply. I’ve been working ‘old school’ doing line drawings ( with a twist! for my mother to colour in, she has early stages dementia and loves water soluble pencils and challenging drawings ) and the rough to finish to print ready ( small commercial printer to scan/print to A2 cotton rag) is full of repetitions, that might just be less time consuming with a drawing program. So I will definitely try out the demo version.